worse :( shes either dilusional or desperate but she coos to every male bird outside of the house and one landed near the window this morning and did the courting dance and she went insane she cooed back at him, would duck her head swell her neck plummage and then coo more to him(she did the oooh oooh coo). she wanted so bad to get to him :( im wondering if what she needs is a male friend not a female? she stays away from the baby female i have now but she gets so upset when she hears males coo. [i]what do i do?? Probably she would find companionship with another hen. ok and do u trim the nails of your birds? You may need to if they are getting really long. Just trim the very tip if they are sharpe. Do the same if they are too long...just little bits at a time because you don't want to cut so short the nail bleeds. You will need to have some flour or baking soda handy, in case one does bleed. The nails are kept short without you having to worry about trimming them. 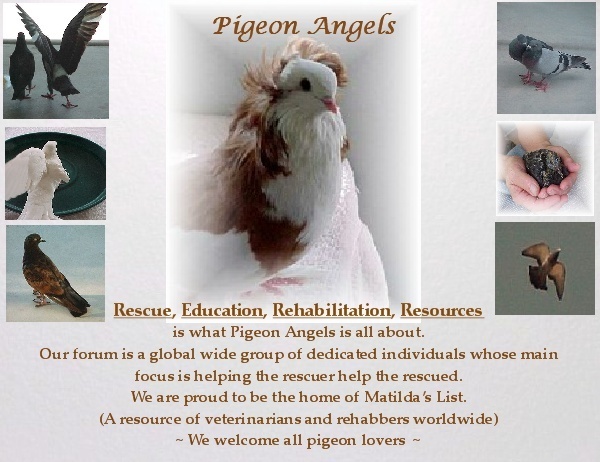 Subject: Re: adopting unreleasable pigeon!